We welcome you to lodge in Rugby with us and enjoy our hospitality! Our lodging is available seven days a week. Where would you like to stay? 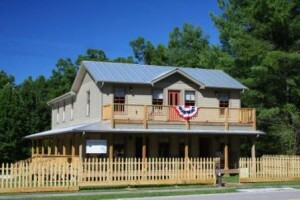 Historic Rugby operates three lodging facilities that suit a variety of tastes, and there are two other lodging options within the village. 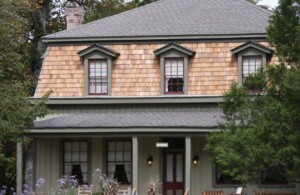 Whether you prefer a large historic Victorian house outfitted with period furnishings, a smaller cozy cottage with all the comforts of home, or a more rustic setting, our lodging options offer a unique, delightful experience. Historic Newbury House is a large Victorian house with a mansard roof built in 1880. It has five bedrooms upstairs and a suite downstairs, a large parlor, a sunroom and a kitchen. Featuring a completely restored exterior and updated interior rooms, Newbury House welcomes children 10 and up, but no pets, please. It is now possible to rent the entire building at a specially discounted rates. Please contact us for more information. Percy Cottage is a small, quaint 1977 restoration of a historic house. It has a large bedroom, parlor and a new bath downstairs and two bedrooms, small bath, and a kitchenette with sitting room upstairs. Percy Cottage is perfect for families or small groups of friends! Children are welcome, but no pets, please. 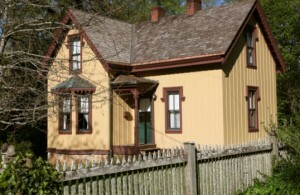 Pioneer Cottage was the first lodging facility built in Rugby and, true to its name, retains its rustic charm. Pets and children are welcome. Read more about each lodging facility and view the rooms under Rugby Lodging! 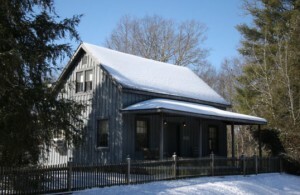 The newly reconstructed Alexander-Perrigo House is the home of Spirit of Red Hill Nature Art and Oddiments and lodging that is designed solely for your relaxation and comfort. The Bensted Bedstead is an open, wheelchair-accessible room that includes a barrier-free shower, microwave, small refrigerator, lift chair and WiFi. A sunroom and porch are also available for your private use in the evenings. Breakfast is served Friday through Sunday at the charming Harrow Road Cafe and is included in your room package. For reservations, please call toll Free: 1-855-392-9332, or local: 423-628-5562 or 423-627-4397. Email is homeplace@spiritofredhill.com. Oak Lodge was originally built to handle overflow from Rugby’s Tabard Inn. The lodge is ideal for families or groups. To learn more about rates and reservations, contact Historic Rugby at 423-628-2441.